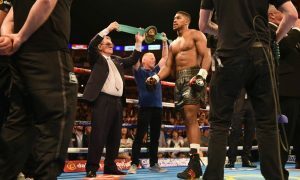 Anthony Joshua was born the 15th October 1989 in Watford, Hertfordshire, England. Joshua loved sports from a young age in particular basketball and athletics. He currently holds the record for sprinting. In year nine he broke the 100m record with a time of 11.6 seconds. “What can I say? He walked in, I was training his cousin, Ben Lleyemi, who actually turned out to be ABA heavyweight champion. 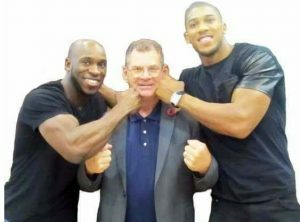 They won the top ABA title at the same time – Joshua obviously was a super-heavyweight. “The day he walked in I knew he was going to be a champ – I knew it straight away. It’s just one of those things any trainer looks for, a potential champ, world champion. He walked in and that was it I knew it from day one, it’s just one of those things. “I went back to my partner that night and she said what you laughing at I said “well what’s happened tonight, is ones walked in, and he’s going to be a world champion” I’ve said that many times. (From left to right rear) Sean Murphy, Ray Duffy, John Oliver, Anthony Joshua, Gary Foley. 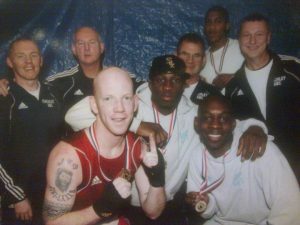 (Front) Jim Duffy, Benga illeyemie, Norris Tompson – All Four Boxers Won Gold Medals at The Harringaye Box Cup. 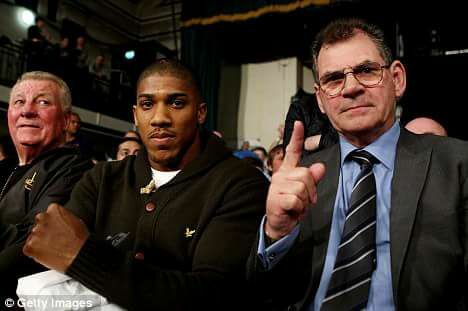 “What made not only Joshua a good boxer and a good champion down the club at that time. It wasn’t just me, Sean Murphy, Gary Foley, Paul Newton, John Shannon, my late brother Jimmy Oliver and George Philips all helped Joshua. “I’ve always said to any boxer who comes in the gym “try and grab as much information off any trainer because we’re all different, every boxer is different, every trainer is different” and every single trainer, it doesn’t matter who they are. They’ve got information and knowledge that you can grasp and at some stage it will come back to you. “When he walked in the first day I was amazed how good his reactions were. I said “where have you been boxing?” he said “I haven’t.” I said, “you must have been somewhere.” He said, “not really, I’ve been playing around a couple of times but I’ve only come down here to get fit”. I said, “you must have done something.” He said, “I’ve done athletics, sprinting and basketball”.